I'm seriously loving this spring's pantone color palette! The colors are so wearable and will go well with what is already hanging in my closet. If you don't already have some of these colors in your wardrobe, a super easy way to wear the palette is through nail polish, especially if you're hesitant about the colors. 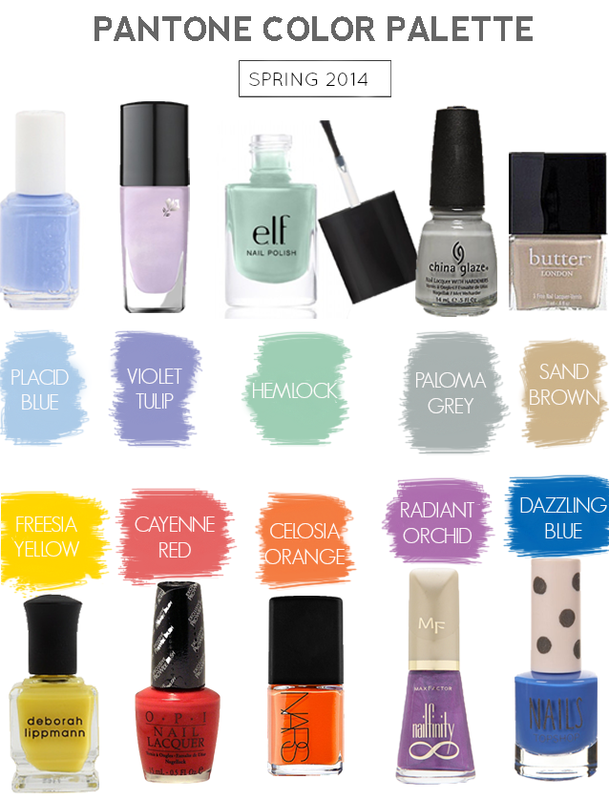 Nail polish is a super low commitment way to find out which colors work for you. You might actually even have some of these colors already laying around. I know that I've got great cayenne red, hemlock and placid blue options already. I'm on the fence about freesia yellow and sand brown but will be definitely be picking up a radiant orchid polish next time I'm at CVS. If you're local, I hope you're keeping warm and enjoying today's snow day! Are you day dreaming about shopping for spring like me? Use the rafflecopter below to win 2 VIP tickets for Fashion for a Fraction and come shop with me on February 22nd. If you're not local and its warm where you are, I'm jealous.